Yong Nuo YongNuo Speedlite YN-565EX Shoe Mount Flash for Nikon. Shipped with USPS Priority Mail. 2 YONGNUO YN560 IV Wireless Speedlite Flashes and 1 YN560 TX Manual Flash Controler. Condition is Used. I used this equipment with my Canon 5D Mark IV and are all still in excellent condition. They all work great I am just switching to all flashpoint lights. Shipped with USPS Priority Mail. Excellent condition used Canon 580EX Speedlite with soft case and Mini Stand, in original box. Targus Digital TG-DL20C Pro Electronic Flash for Canon DSLR Cameras. Condition is New. Shipped with USPS First Class Package. Packaging is busted up pretty good but the flash has never been on a camera. I put two batteries in it and it tested perfect. I ship within one BUSINESS day, at my cost, if it's less than posted i refund any difference. This flash is in good working and physical condition. The body of the flash only shows very minimal signs of wear from use and age. No batteries are included (Uses AA Batteries). All images are of the actual item that is for sale. LEDs on unit display zoom position, auto flash confirmation. 4 bounce positions, 6 auto zoom positions. The Opteka IF-800 automatic high-power flash unit with built-in 3-LED Video Light is the perfect accessory for anyone looking for evenly lit video capturing, reduced red-eye or additional power for all types of picture taking. This flash can be. 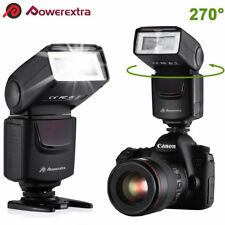 Canon Speedlite ST-E2 Shoe Mount IR Transmitter for Flash with case. Excellent condition. Functions perfectly. Shipped via USPS Priority Mail. Canon speedlite 430ex. Condition is Used. Shipped with USPS Priority What you see is what you will get. Just the flash and case. The wireless trigger: S1/S2 induction flash. 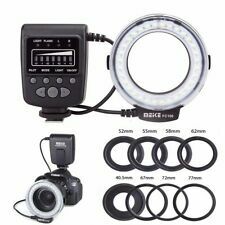 KIT INCLUDES: (1)NW-561 Speedlite Flash,(1)Hard Diffuser,(1)CT-16 Wireless Trigger,(1)Microfiber Cleaning. 1 x Hard Diffuser. CT-16 Wireless Trigger Swinging/Tilting flash head (bounce flash). Provides added light for darker settings and creative shots: To accommodate your photography needs. Focus-assist light: Ensures rapid focusing in dark areas. Barely used and in great condition, YONGNUO YN660 GN66 2.4G Wireless Master Speedlite Flash for Canon Nikon Cameras. Shipped with USPS Priority Mail. This canon speedlite is in great working condition, the red cover for the infered in missing but it still works fine. 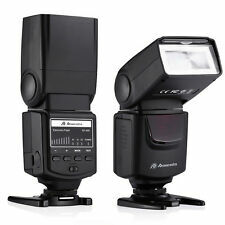 Ultimaxx Universal TTL Flash for Canon & Nikon. Full Digital TTL dedication. Slow synchronization (For Nikon only) . Dedication: ETTL I / II (Canon), ITTL (Nikon). Flash ready indicator in viewfinder.